Stand Aside Kmart, We’ve Got The Must Have Girls Shoes To Go With Any Christmas Dress. So, we’ve gone and put together the most adorable girls’ shoes to go with that Christmas outfit. And for no other reason than we love shoes! It’s a fact, no Christmas outfit is complete without a cute pair of kicks to top it off! How many times do you look at the Santa photos and wish you’d matched the shoes! Now a good pair of white shoes will always work. And the best part is they will go with every other outfit in her wardrobe too. But, if it’s red you’re after, then we have the mostto-die-for pair of Cons that are guaranteed to make those Santa photos sparkle. And we mean sparkle! Santa photos won’t be the same again! Step aside Kmart, we’ve got you covered. Red Sparkle Cons To Make Dorothy Jealous! What little girl doesn’t love all things glitter and sparkle. Most the time it’s pink or purple. 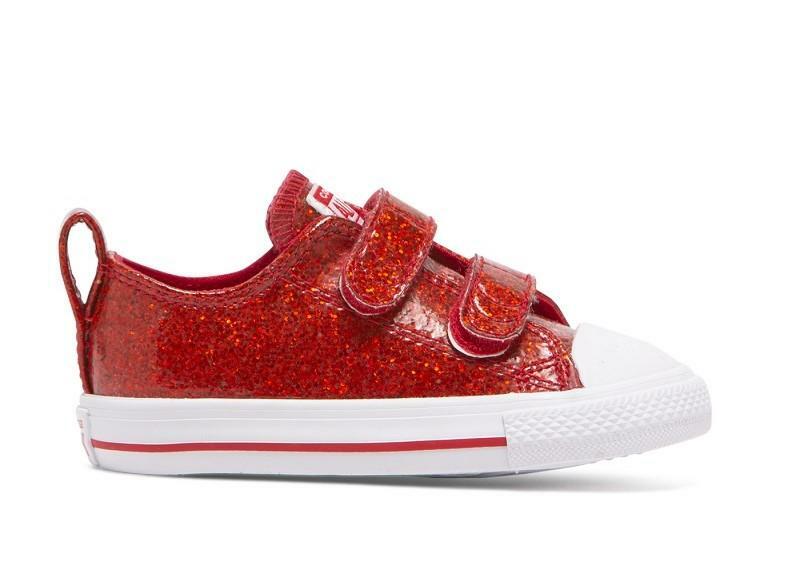 So what if I was to tell you we’ve gotRed Sparkle Converse CTAS just for your little girl! Everyone will be asking where you got them from. If it’s a bargain that you’re after, then you can’t go past our Milly Mary Jane’s. Adorned with a cute little bow and the most gorgeous red patent leather, they’re as classic as they come. But get in quick, they are selling like hot cakes at only $20! Unicorns and Baby’s First Christmas Photos - Match Made In Heaven! We’ve got these little cuties in the list because how can you go past a unicorn! Our gorgeous whiteBaby Paws Unicorn Baby Shoes are perfect for those first Christmas photos! As we said, a good pair of white shoes will work with any outfit. So, what about some girls white leather sandals with a bit of flare?Surefit Jodie Sandals are the cutest white sandals with a fun metallic trim to make those outfits shine! If Pink Still Wins, Vans are In! Yes, some little girls just can’t get past that pink. And that’s ok, ain’t nobody going to ‘dis a girl for liking their signature colour right! These littleVans Glitter Stars will add that much needed splash of sparkle to the Santa photo whilst keeping your little princess well and truly happy! If you’re still stuck for a match, check out our whole range ofgirls shoes where you might also come across a rainbow unicorn or two!